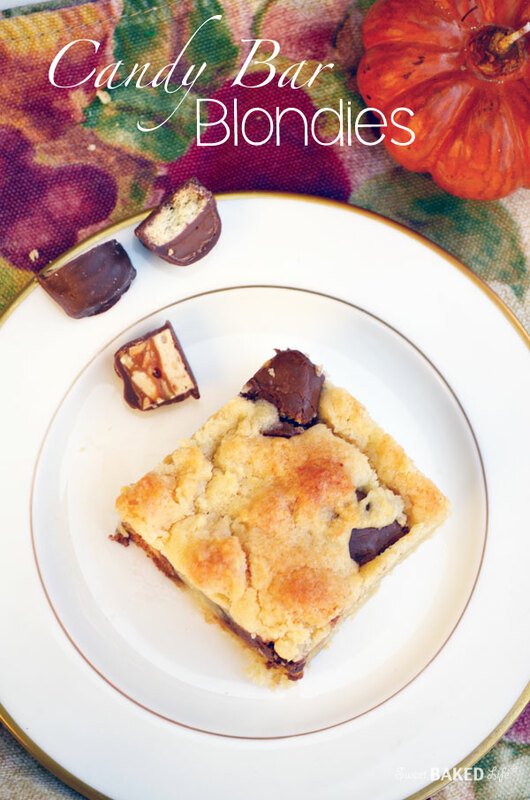 With Halloween just around the corner, these Candy Bar Blondies are a great way to create a spooktacular fall dessert! If you’re like me, you’ve probably been stocking up on your favorite Halloween candy for months! And with that being said, do you still have any of those early buys of the sweetest little candies in your cupboard for the kids that will ring your bell for tick or treating? In our home, I buy the candy, then somehow the bag gets opened. And when that happens I think, “I’m just going to have one of these.” I repeat this ritual over several days, until one day when I reach into the bag and it has gone empty! How did that happen? Did I really eat all of those mini Rollo candies? I know it had to be the hubby or son because they always find my candy hiding places. But, hmmmm, did they even know I had bought and hid these little treats? Probably not! 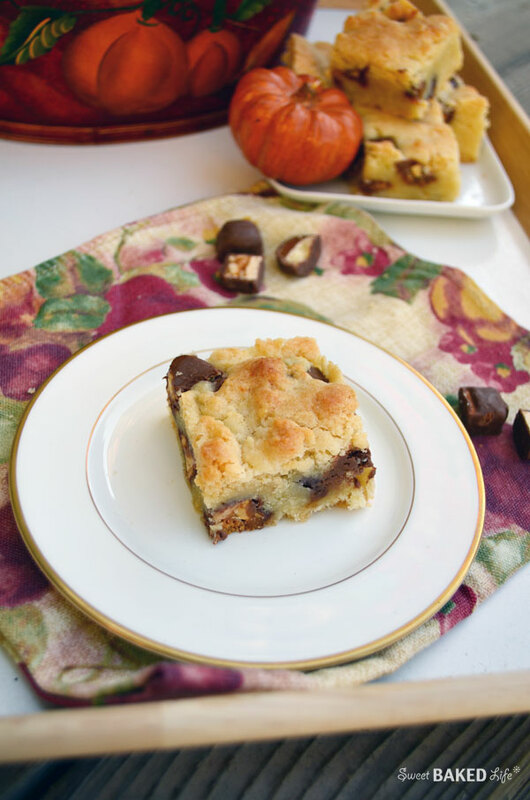 So if you find yourself in this predicament before the bewitching hour of October 31st, I would suggest that you go out and buy your favorite bite sized Halloween candy and whip up a batch of these satisfying Candy Bar Blondies for yourself! And be sure to buy a few extra bags for the kiddos! You start with a soft buttery base and mix in mounds of Twix and Snickers (two of my favs), but you can use any type of candy that you like to make your very own customized spookalicious treat. These treats will satisfy your candy craving so you won’t be tempted to sneak into that hidden bag of candy and you’ll be able to pass out yummy treats for the little ones dressed up so cute. 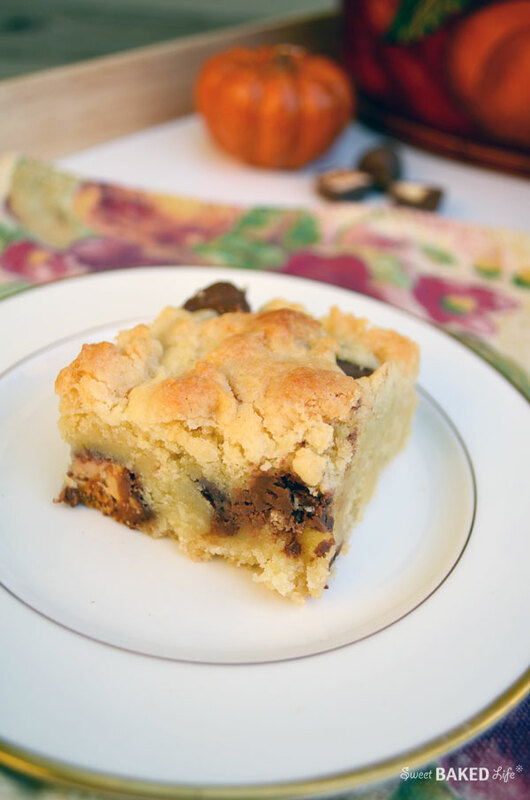 As well, you can wait to make these decadent blondies until you raid your own kids bag (of course with their permission) from their score of sweets from the neighborhood! Heat your over to 350 degrees. Prepare a 13×9-inch pan with non-stick spray and set aside. In a large bowl, add the cake mix and melted butter. Stir until combined. Then add the eggs and mix well. Add the vanilla and stir. Then fold in the Twix and Snickers candy. Note, the mixture will be thick. Dump the mixture into the prepared pan and spread evenly with a spatula. Bake for 30-40 minutes until the top is golden brown and a toothpick comes out clean when inserted into the center. Do not over bake or they will become hard. I know you will love these Candy Bar Blondies just about as much as you enjoy sneaking a your favorite treat from the candy bag! Hey Sheila! 🙂 I think this recipe would be perfect for Halloween! Thanks for the post.